I have to admit that I am not the biggest fan of glitter. Mostly I don't love the mess that it makes everywhere. You can't craft with it, decorate with it, or store your crafted decorations without a ton of glitter getting everywhere. Even if you use all of the tricks. But that doesn't mean I don't love a little shine or sparkle. Angela did just that, without any glitter, when she created this Valentine thumbtack art. Lots of metallic shine in the perfect DIY piece. And although it is cute for Valentine's Day, there is no reason this ampersand can't stick around after February 14th. Or you could use the same thumbtack and canvas idea for a monogram or number. 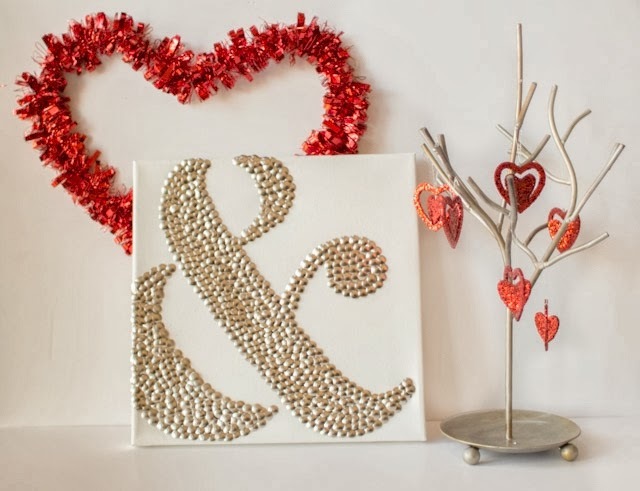 You can check out how to make ampersand thumbtack art over at Life in Velvet. looks expensive! Great idea thanks for sharing Lorie! Very cool! I love projects using nailhead trim/thumb tacks! Thanks for sharing!